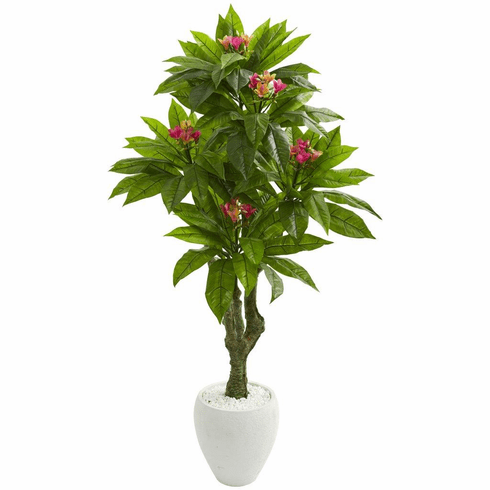 This plumeria artificial tree will instantly refreshen your space with its several layers of lush green leaves and colorful blooms sprouting out of the authentic-looking trunks. A tropical atmosphere can be yours all the time both indoors and out, thanks to its UV resistant materials. Perfect for your outside porch or place it in your master bath next to your towel rack to create a relaxing at-home spa vibe. Comes in a white decorative planter with a bed of natural-looking river rocks for a complete look. Height: 5.5 Ft., Width: 30 In., Depth: 26 In., Color: , Pot Size: H: 12 In. W: 12 In. D: 12 In.